A clear standout among Pong Nam Ron hotels, you can unwind in 40 square meters of spacious comfort overlooking the beautiful greens and fairways of the golf course in one of our 15 Deluxe Mountain View Rooms. The recently renovated guest rooms feature a relaxed and refreshing contemporary style, reflecting the natural beauty of Soi Dao Mountain, as well as all-new entertainment systems and connectivity to ensure that your home comforts are never far away. 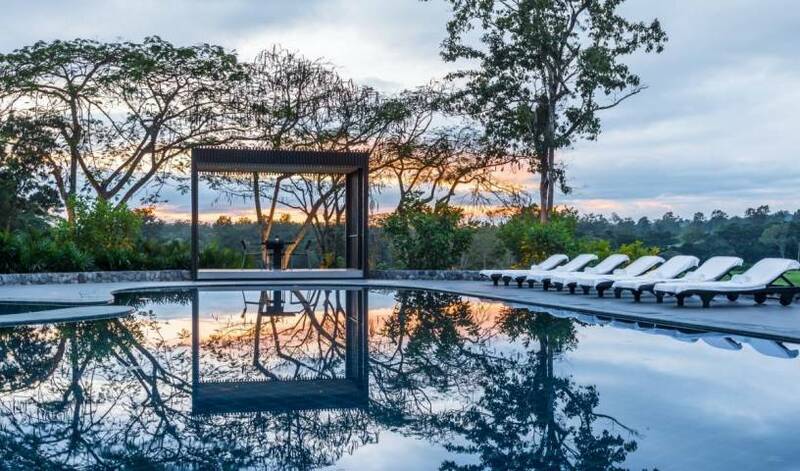 Other additions include complimentary Wi-Fi internet, daily breakfast in all the rooms, satellite television and individually controlled air-conditioning. With a choice of twin, double or king-sized beds, every room promises a dream-filled night's sleep, making sure you wake up refreshed and rejuvenated for another challenging round of golf or exploring the natural local attractions, right on your very doorstep. Our 31 Grand Deluxe Mountain View Room offer beauty, comfort and pure relaxation during your stay. With all the 40 square meter rooms being corner units, you’re guaranteed to enjoy picture-perfect vistas of the surrounding golf course and lush mountains from the comfort of your private balcony. Enticing king-sized beds beckon as night falls to ensure a perfect night's rest, before waking up and enjoying yet another stunning sunrise from your balcony or within the cosseting ambience of your room. Pong Nam Ron resorts like ours take more effort to please guests by offering complimentary daily breakfast and free Wi-Fi available throughout the property. Soksan Street, Svay Dongkum, Siem Reap. #051, Soksan Street, Stengthmey, Svaydangkum, Siem Reap. Air conditioning, In-room safe box, Internet WiFi access in room, Shower, Toiletries, Towels provided. Air conditioning, Bathroom with shower Coffee/tea making facilities, Hair dryer, Internet WiFi access in room, Mini bar, TV–cable/satellite, Toiletries, Towels provided, Washer/dryer. The Landmark Room simply features with space to provide enough a comfortable couch seating for two inside and a private balcony overlooking coconut trees garden or city view of Siem Reap. Elegant Suite is the only hotel suite in Siem Reap that provides you an intimate experience of romance and harmony. The 72 sqm Elegant Suite is designed with its understated elegance offering a bedroom and a spacious living room equipped with modern technological amenities. The ultimate comfort is reflected in our Hotel designed Sokha Roth Hotel comes with three-storey, Consist of 57 guest Rooms and Food & Beverage outlets such as Restaurant, Bar and Lounge Deluxe Room and Family Room. All guest Rooms and Family are standard and provided with: Bathroom – Air-conditioning, Private Safe, Mini Bar, Cable Television Channel, Coffee, Sugar, 2 water bottles and Green tea making facilities. Room for 2 people with fan, WiFi in rooms, desk, window, cable TV, private bathroom, hot & cold shower. ** Free bicycles ** Enjoy your free pick up service, please provide us your arrival details i. e. flight number, bus or boat company's name and arrival time. Room for 3 people with fan, WiFi in rooms, desk, window, cable TV, private bathroom, hot & cold shower. ** Free bicycles ** Enjoy your free pick up service, please provide us your arrival details i. e. flight number, bus or boat company's name and arrival time. Room for 2 people with A/C, fan, WiFi in rooms, desk, window, cable TV, private bathroom, hot & cold shower. ** Free bicycles ** Enjoy your free pick up service, please provide us your arrival details i. e. flight number, bus or boat company's name and arrival time. Room for 3 people with A/C, fan, WiFi in rooms, desk, window, cable TV, private bathroom, hot & cold shower. ** Free bicycles ** Enjoy your free pick up service, please provide us your arrival details i. e. flight number, bus or boat company's name and arrival time. Room for 1 person with A/C, fan, WiFi in rooms, desk, window, cable TV, private bathroom, hot & cold shower. ** Free bicycles ** Enjoy your free pick up service, please provide us your arrival details i. e. flight number, bus or boat company's name and arrival time. Room for 1 person with fan, WiFi in rooms, desk, window, cable TV, private bathroom, hot & cold shower. ** Free bicycles ** Enjoy your free pick up service, please provide us your arrival details i. e. flight number, bus or boat company's name and arrival time. Featuring views of the city, air-conditioned rooms are fitted with parquet flooring, a satellite TV and seating area. Each room includes an attached bathroom that comes with a shower, and free toiletries. Featuring views of the city, air-conditioned rooms are fitted with parquet flooring. Each room includes many shared bathroom that comes with a shower, and free toiletries. Perfect for the single traveller on a buget. Beautiful room for the economy minded traveller, comfortable for two people. Luxurious Double and Twin beds with full amenities. Wonderful family rooms with 3 large beds beauty fully decorated. Luxurious Deluxe Double and Twin beds connecting room with full amenities. Our room accommodation in Siem Reap, Cambodia has a view with a balcony overlooking an exotic tropical garden. Enjoy our outdoor swimming pool, fitness center, or indulge in a relaxing massage. Residence Suite offers 36 square meters King size Bed, Crisp fine Cotton Sheets, excellent lighting, Dressing Area, large Writing Desk, balcony. The terrazzo Bathroom has a large 2 person Bathtub with hot or cool water, separate Rain Shower with Hand shower, Toilet area and Basin with Make-up Mirror. Enjoy the A la Carte Mini Bar, Personal Room Safe and Complimentary wireless internet access. The Room features locally sourced materials of; Timber, Handmade Clay Bricks, Stone and Terrazzo, cleverly crafted into a minimalist timeless Design. All rooms are non-smoking. Honeymoon Suite offers 46 square meters King size Bed, Crisp fine Cotton Sheets, excellent lighting, Dressing Area, large Writing Desk, balcony. The terrazzo Bathroom has a large 2 person Bathtub with hot or cool water, separate Rain Shower with Hand shower, Toilet area and Basin with Make-up Mirror. Enjoy the A la Carte Mini Bar, Personal Room Safe and Complimentary wireless internet access. The Room features locally sourced materials of; Timber, Handmade Clay Bricks, Stone and Terrazzo, cleverly crafted into a minimalist timeless Design. All rooms are non-smoking. Luxury Triple Suite offers 46 square meters 1 King and 2 single Beds, Crisp fine Cotton Sheets, excellent lighting, Dressing Area, large Writing Desk, balcony. The terrazzo Bathroom has a large 2 person Bathtub with hot or cool water, separate Rain Shower with Hand shower, Toilet area and Basin with Make-up Mirror. Enjoy the A la Carte Mini Bar, Personal Room Safe and Complimentary wireless internet access. The Room features locally sourced materials of; Timber, Handmade Clay Bricks, Stone and Terrazzo, cleverly crafted into a minimalist timeless Design. All rooms are non-smoking. Phum Treang, Khum Svaydangkum, Siem Reap, Cambodia. 4-Star French colonial-style Siem Reap Hotel at Angkor, Cambodia. 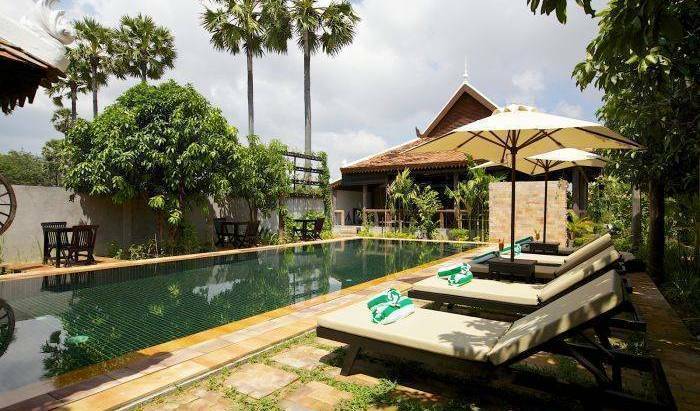 La Villa Coloniale offers easy access to Angkor Wat, luxury accommodation furnished with authentic French colonial period furniture and decorated in tasteful French style. The Chambre Sisowath Superior Double Room at our La Villa Coloniale is lavishly furnished in authentic French colonial period style. 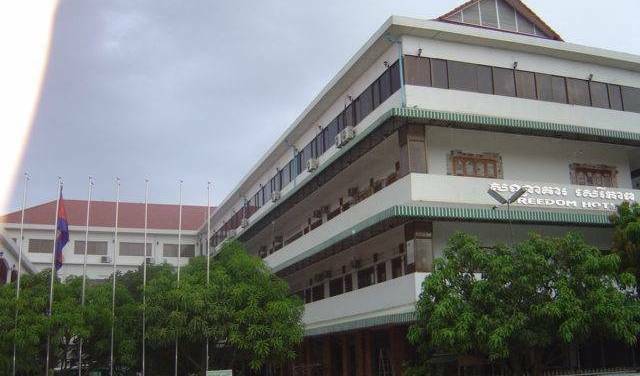 This property is located in the brighter Mouhot building and contrast well with the Sisowath rooms which feature more dark hard wood furniture. The room match the overall cultural and historic ambiance of La Villa Coloniale. The hotel provides spacious rooms with discrete LCD TVs and other modern appliances, a full service spa, restaurant, library and swimming pool. This is Non-Smoking room. The Chambre Sisowath Deluxe Double Room at our La Villa Coloniale is lavishly furnished in authentic French colonial period style. This property is located in the brighter Mouhot building and contrast well with the Sisowath rooms which feature more dark hard wood furniture. The room match the overall cultural and historic ambiance of La Villa Coloniale. The hotel provides spacious rooms with discrete LCD TVs and other modern appliances, a full service spa, restaurant, library and swimming pool. This is Non-Smoking room. 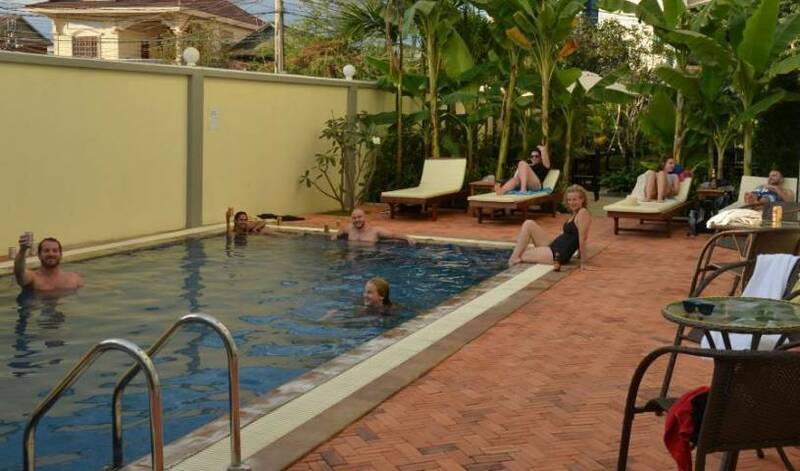 Welcome to “The Dancing Frog” hostel located in Siem Reap town centre close to restaurants, shops and the nightlife. With two twin beds in each twin bungalow and a nice sitting area nestled in a bay window overlooking the grounds. These Twin Bungalows are perfect for friends traveling together and highlights Cambodia past and present! The balcony overlooks the pond and pool and is the perfect place to enjoy a cup of tea in the morning before heading to the temples. Save much, enjoy more of luxurious style interior with variety of accommodation from solo traveler to family to business travelers. These dormitory rooms are equipped with basic amenities and power, as well as basic storage space for the inhabitants. These dormitories are female which situated in different wing. Save much, enjoy more of luxurious style interior with variety of accommodation from solo traveler to family to business travelers. These dormitory rooms are equipped with basic amenities and power, as well as basic storage space for the inhabitants. These dormitories are mixed which situated in different wing. Perfect for couples who want a bit of privacy, this 2 occupancy room features a spacious bed for those nights where you want a little more comfort. The private rooms are exclusively located on 3rd floor, providing you with ample space for storing your belongings and getting ready for days out in Siem Reap. Brilliant for enjoying the communal vibe of Twizt before retiring to a very comfortable private space. Our standard Double and Twin room features a double or two single beds which can be great for couple. All the basic amenities are provided in this 2-occupancy room, which provides occupants with extra space when compared to a shared dormitory room. If you’re two or a couple which is looking for privacy at an affordable rate, then our standard double and twin room could be the perfect solution for you. Perfect for couples who want a bit of privacy, this 2 occupancy room features a spacious bed for those nights where you want a little more comfort. The private rooms are exclusively located on 3rd floor, providing you with ample space for storing your belongings and getting ready for days out in Siem Reap. Brilliant for enjoying the communal vibe of Twizt before retiring to a very comfortable private space. The Family dormitory room at the Twizt Designed from the heart to unite your stay and keep enclose every one of your family throughout the night and with all luxurious style interior will deliver you to the whole new level of Hostel Experience. These triple rooms, you will have a choice of three separate single beds of 1. 20 m x 2. 00 m each in a room or one queen size bed 1. 80 m x 2. 00 m and one single bed 1. 20 m x 2. 00 m in a room. These triple rooms can accommodate a family with one child or three adults sharing. All rooms with terrace in front for direct access to the Swimming pools. All of these rooms are equipped with double beds or a queen bed, tastefully appointed with with Cambodian art décor style furnishing and all rooms with terrace in front for direct access to the Swimming pools. Room with Air-Con, ceiling fan, free WiFi in room, writing desk, window, cable TV, private bathroom, hot & cold shower. Daily house keeping service, included towel, linen, soap & toilet paper. Free pick up service please contact us for details. Just few steps of the room, we will overlook the swimming pool surrounded by tropical garden. Choosing deluxe room as your Single, Double and Twin occupancy. 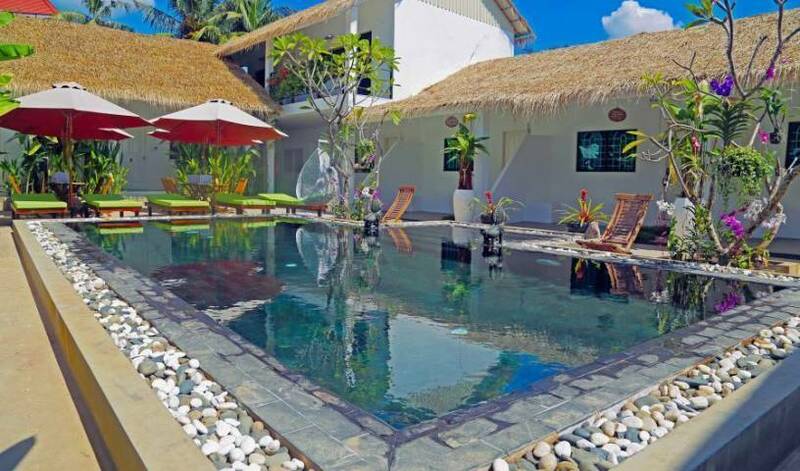 Situated in the secluded floor of the establishment overlooking the garden and swimming pool. It features a king sized and two single beds to accommodate a family with four members. 3rd floor. A 27sq metre room configured with two queen beds. With an en suite bathroom featuring both shower and bathtub. Serviced daily with tea, coffee and 2 bottles of water provided. 40 square meters, air conditioned bedroom with a minimum of 2 King Beds. A separate en suite and a combined Kitchenette, dining, lounge area. Breakfast is available in our restaurant for a surcharge. Room with 2 single beds is air-conditioned and equipped with a cable TV, writing desk and wardrobe. They also have a fridge and en suite bathroom with free toiletries. 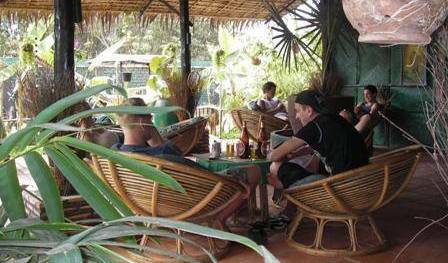 The rooms are fully air conditioned and well equipped with a cable TV, a writing desk and a wardrobe. They also have a fridge and an en suite bathroom equipped with free toiletries. With our Premier Landmark and package, we fulfill your needs what you plan to do before traveling. From your arrival up until your departure day, you can stay connected with your family and friends via free private phone call, enjoy either a free-flow cocktail at an elegantly designed rooftop lounge or in-room mini-bar. Let explore our historical town of Siem Reap with an exclusive 24-hour private car provided throughout your stay. The Sunset Suite Package covers almost more than what you have planned. Get yourself ready to go for a daily temple tour with a very knowledgeable tour guide who tells you the main interesting story of each of the temple site you visit. Refresh your day at our traditional Khmer-designed Mudita Spa with our therapist. Stay in and just order our room service to save your energy for a typical country’s picnic lunch in the following day. Deluxe Double Room is located on the ground floor, first floor, second floor, third floor with 36 sqm of spaces. It consists of one double king-size bed. King Suite is the Suite Twin Room that located on the ground floor, first floor, second floor, third floor with 42 sqm of spaces. It consists of two king-size beds and it is good for couple. Family Room with Balcony is a suite room that located on the third floor with 78 sqm of spaces. It consists of three king-size beds and the connecting room that is good for a family with children. 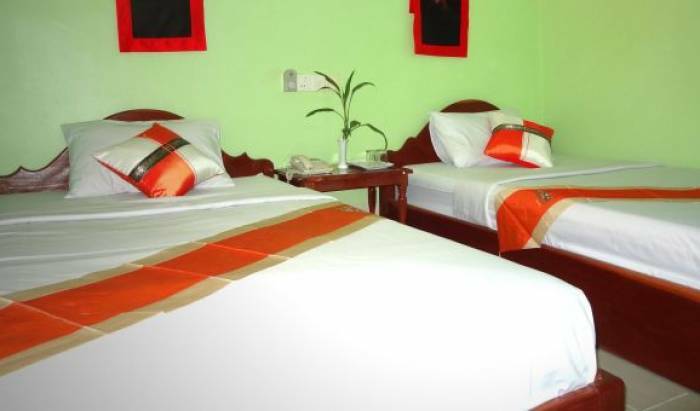 The room is very comfortable, exotic wood with all Khmer charming, decorated with high quality of Khmer silk and are equipped with high quality of amenities to meet guest’s satisfaction. Two choices of Pool view or Museum view, some has private balcony with pool view, and the room size is up to 32 sqm with one extra bed can be allowed. These are 5 elegantly designed rooms furnished with wooden sets of furniture with pure white cotton duvets and feather pillows and with the net. Traditional Khmer ornaments abound like colorful silk throw pillows and bed runners as well as hanging adornments. Just like the Deluxe Rooms, the Superior Rooms come in Double, Twin-sharing beds, Double beds and all have complete amenities to note. The only difference with Deluxe Room is Twin Bed with the net design that is a special feature of the superior rooms. These are 5 elegantly designed rooms furnished with wooden sets of furniture with pure white cotton duvets and feather pillows and with the net. Traditional Khmer ornaments abound like colorful silk throw pillows and bed runners as well as hanging adornments. Just like the Deluxe Rooms, the Superior Rooms come in Single, Twin-sharing beds, Double beds and all have complete amenities to note. The only difference with Deluxe Room is Twin Bed with the net design that is a special feature of the superior rooms. These are 2 elegantly designed rooms furnished with wooden sets of furniture with pure white cotton duvets and feather pillows. Traditional Khmer ornaments abound like colorful silk throw pillows and bed runners as well as hanging adornments. Just like the Suite Balcony Rooms, the Deluxe Rooms come in Single, Twin-Share beds, Large Double beds (King Size) and all have complete amenities to note and come with Balcony. The guests will feel comfortable when relax on the King size bed in the Deluxe Room because everything come with the high quality. These are 2 elegantly designed rooms furnished with wooden sets of furniture with pure white cotton duvets and feather pillows and with the net. Traditional Khmer ornaments abound like colorful silk throw pillows and bed runners as well as hanging adornments. Superior Triple Rooms come without Balcony and have 1 Single and 1 Double beds and all have complete amenities to note. The only difference with Family Room is family room come with 1 Double and 2 Single Beds. These are 3 spacious rooms with Single, Double with balcony with themed decor of elegant indigenous Khmer accents giving guests the feel of warmth, luxury and comfort of home away from home! The 200 square foot rooms include high quality cotton duvets and feather pillows, bathrobes, slippers, complimentary bottled water, coffee , fresh fruit and tea-making facilities and bathroom accessories. The Room come with traditional king bed.. and design very best comfortable for the special guest who decide to book this Room.. A wood door opens to the terrace designed for guest's comfort where they could relax sipping tea or coffee or simply enjoying a goblet of wine drinks after a hard day's tour. These is only 1 elegantly designed rooms furnished with wooden sets of furniture with pure white cotton duvets and feather pillows and with the net. Traditional Khmer ornaments abound like colorful silk throw pillows and bed runners as well as hanging adornments. Just like the Deluxe Rooms, the Superior Family Rooms come in Twin-sharing beds and Extra large Double beds and all have complete amenities to note. The only difference with Deluxe Room is Balcony and the net design that is a special feature of the superior rooms. These is only 1 elegantly designed rooms furnished with wooden sets of furniture with pure white cotton duvets and feather pillows and with the net. Traditional Khmer ornaments abound like colorful silk throw pillows and bed runners as well as hanging adornments. The Big Family Rooms come in 3 Large Double beds and all have complete amenities to note. All of our Superior guestrooms are equipped with standard in-room amenities to ensure the maximum comfort for guests. Wireless internet access, fan, hot water, room service, breakfast for two, coffee & tea, bottled water, cable television (80 channels), air conditioning, mini fridge and safety deposit box are among the amenities guests will find in their room. Room includes 1 double bed. Like Superior Double Fan Room, but for single person only. A single villa located at the base of a little slope close to the center in area 40 square meter well designed with A double bed suitable for a couple, each room comes with air condition, refrigerator, 21T. V., DVD player, Bath tub, hair dryer, complimentary Tea maker, safe deposit, Bath robe, slippers and bath room amenities with big balcony in front of the room. 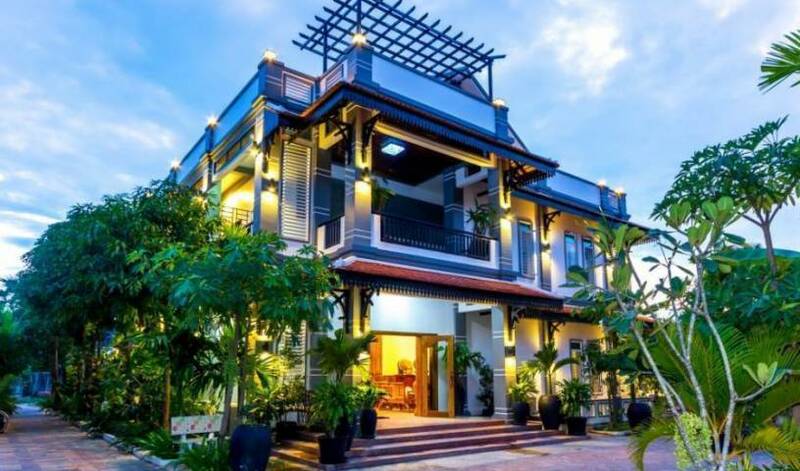 Located a whole 200 metres from Bang Bao Beach and the stilted fishing village in the bay, with its local small and quaint shops and restaurants the whole location is a feast for your eyes.